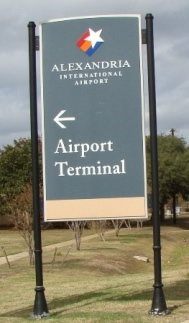 Alexandria International Airport (AEX) is located about 4 miles northwest of downtown Alexandria. To reach the airport, take the Air Base Road (Highway 498) exit #90 from I-49, and drive west, about two miles to the terminal. AEX can also be reached from State Highway 28 West, and then on Highway 3054. In October of 2011, the terminal was named the James L. Meyer Commercial Terminal in honor of the man who was a major driving force in the development, and success, of England Airpark. The terminal features the latest in travel conveniences. For example, charging stations have been installed for convenient charging of travelers' phones, tablets, and devices. AEX includes two runways: Runway 14/32 - 150' x 9350' grooved concrete, and Runway 18/36 - 150' x 7000' asphalt. AEX is located at the site of the former England Air Force Base. When the base closed, commercial airport operations were transferred to AEX from Esler Field which is located east of Pineville. Rental cars are available from Avis, National, Budget and Hertz. Hotels are located about a mile from AEX, at the Airbase Drive exit 90 from I-49, including the Hampton Inn & Suites Alexandria and LaQuinta Inn & Suites. A Cracker Barrel Store is located nearby at the I-49 exit along with several fast-food outlets.